The Macedonian phalanx is an infantry formation developed by Philip II and used by his son Alexander the Great to conquer the Achaemenid Empire and other armies. Phalanxes remained dominant on battlefields throughout the Ancient Macedonian Period, although wars had developed into more protracted operations generally involving sieges and naval combat as much as pitched battles, until they were ultimately displaced by the Roman legions. Philip II spent much of his youth as a hostage at Thebes, where he studied under the renowned general Epaminondas, whose reforms were the basis for the phalanx. Phalangites were professional soldiers, and were among the first troops ever to be drilled, thereby allowing them to execute complex maneuvers well beyond the reach of most other armies. 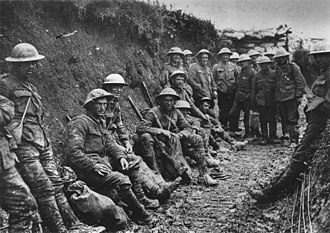 They fought packed in a close rectangular formation, usually eight men deep, with a leader at the head of each column and a secondary leader in the middle, so that the back rows could move off to the sides if more frontage was needed. 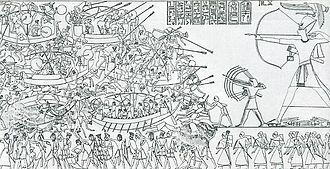 Each phalangite carried as his primary weapon a sarissa, a double-pointed pike over 6 m (18 ft) in length. Before a battle the sarissa were carried in two pieces and then slid together when they were being used. 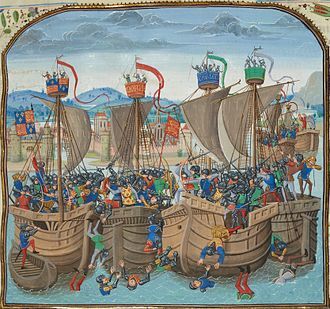 At close range such large weapons were of little use, but an intact phalanx could easily keep its enemies at a distance; the weapons of the first five rows of men all projected beyond the front of the formation, so that there were more spearpoints than available targets at any given time. Men in rows behind the initial five angled their spears at a 45 degree angle in an attempt to ward off arrows or other projectiles. The secondary weapon was a shortsword called a kopis, which had a heavy curved section at the end. 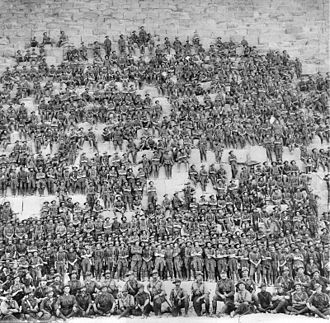 The phalanx consisted of a line-up of several battalion blocks called syntagmata, each of its 16 files (lochoi) numbering 16 men, for a total of 256 in each unit. Each syntagma was commanded by a syntagmatarch, who - together with his subordinate officers - would form the first row of each block. Neither Philip nor Alexander actually used the phalanx as their arm of choice, but instead used it to hold the enemy in place while their heavy cavalry broke through their ranks. The Macedonian cavalry fought in wedge formation and was almost always stationed on the far right; after these broke through the enemy lines they were followed by the hypaspists, elite infantrymen who served as the king's bodyguard, and then the phalanx proper. The left flank was generally covered by allied cavalry supplied by the Thessalians, which fought in rhomboid formation and served mainly in a defensive role. Other forces—skirmishers, range troops, reserves of allied hoplites, archers, and artillery—were also employed. ^ Polybius. The Histories. 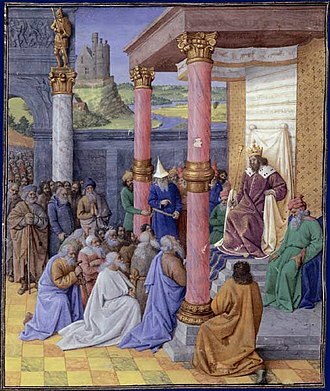 Chapters 28–32. Retrieved 14 September 2014. ^ Connolly, Peter: The Greek Armies, pp. 58-59: "The Macedonian Phalanx". MacDonald & Co. Ltd, London, 1982. ISBN 0 356 05580 9. 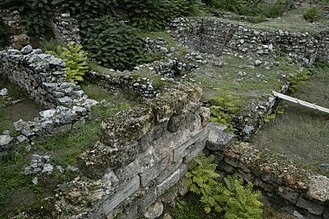 The army of the Kingdom of Macedonia was among the greatest military forces of the ancient world. The latest innovations in weapons and tactics were adopted and refined by Philip II, by introducing military service as a full-time occupation, Philip was able to drill his men regularly, ensuring unity and cohesion in his ranks. 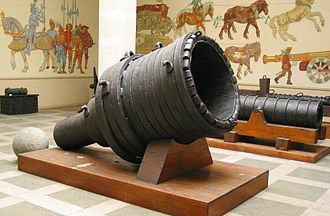 In a remarkably short time, this led to the creation of one of the finest military machines of the ancient world, tactical improvements included the latest developments in the deployment of the traditional Greek phalanx made by men such as Epaminondas of Thebes and Iphicrates of Athens. Philip II improved on these military innovators by using both Epaminondas deeper phalanx and Iphicrates combination of a spear and smaller and lighter shield. 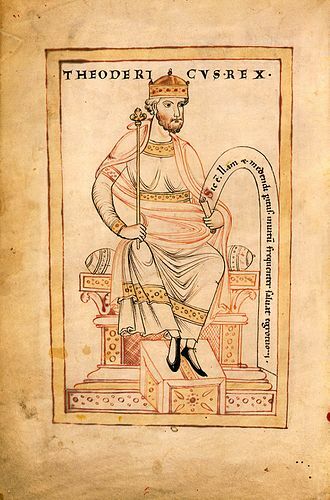 However, the Macedonian king innovated, he introduced the use of a longer spear. The Macedonian pike, the sarissa, gave its wielder many advantages both offensively and defensively, for the first time in Greek warfare, cavalry became a decisive arm in battle. The new Macedonian army was an amalgamation of different forces and other Greeks and a wide range of mercenaries from across the Aegean and Balkans were employed by Phillip. Unfortunately, most of the historical sources for this period have been lost. 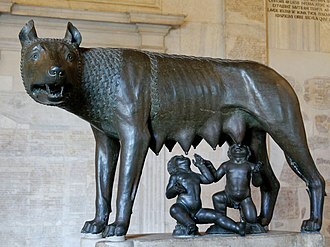 As a consequence, scholarship is largely reliant on the writings of Diodorus Siculus and Arrian, both of whom lived centuries than the events they describe. 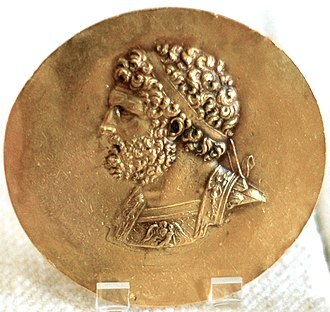 If Philip II of Macedon had not been the father of Alexander the Great, he would be widely known as a first-rate military innovator and strategist. The conquests of Alexander would have been impossible without the army his father created, when Philip took over control of Macedon, it was a backward state on the fringes of the Greek world and was beset by its traditional enemies, Illyrians and Thracians. Macedonian infantry in this period consisted of poorly trained shepherds and farmers, Philips first achievement was to unify Macedon through his army. Philip took pains to keep them always under arms and either fighting or drilling and drills were made into competitive events, and the truculent Macedonians vied with each other to excel. Traditionally, in two-dimensional geometry, a rhomboid is a parallelogram in which adjacent sides are of unequal lengths and angles are non-right angled. A parallelogram with sides of length is a rhombus but not a rhomboid. A parallelogram with right angled corners is a rectangle but not a rhomboid, the term rhomboid is now more often used for a parallelepiped, a solid figure with six faces in which each face is a parallelogram and pairs of opposite faces lie in parallel planes. Some crystals are formed in three-dimensional rhomboids and this solid is sometimes called a rhombic prism. The term occurs frequently in science terminology referring to both its two- and three-dimensional meaning, and let quadrilaterals other than these be called trapezia. Heath suggests that rhomboid was a term already in use. The rhomboid has no line of symmetry, but it has symmetry of order 2. In biology, rhomboid may describe a geometric rhomboid or a bilaterally-symmetrical kite-shaped or diamond-shaped outline, in a type of arthritis called pseudogout, crystals of calcium pyrophosphate dihydrate accumulate in the joint, causing inflammation. The phalanx was a rectangular mass military formation, usually composed entirely of heavy infantry armed with spears, sarissas, or similar weapons. In Greek texts, the phalanx may be deployed for battle, on the march, even camped and they marched forward as one entity. The word phalanx is derived from the Greek word phalangos, meaning finger, the term itself, as used today, does not refer to a distinctive military unit or division, but to the general formation of an armys troops. Thus a phalanx does not have a combat strength or composition but includes the total number of infantry. 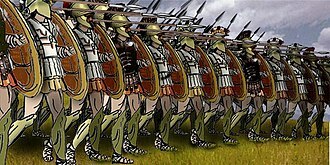 Many spear-armed troops historically fought in what might be termed phalanx-like formations, the word has come into use in common English to describe a group of people standing, or moving forward closely together, c. f. This article focuses on the use of the phalanx formation in Ancient Greece, the Hellenistic world. The earliest known depiction of a phalanx-like formation occurs in a Sumerian stele from the 25th century BC, here the troops seem to have been equipped with spears and large shields covering the whole body. Ancient Egyptian infantry were known to have employed similar formations, the first usage of the term phalanx comes from Homers, used to describe hoplites fighting in an organized battle line. Homer used the term to differentiate the formation-based combat from the individual duels so often found in his poems, historians have not arrived at a consensus about the relationship between the Greek formation and these predecessors of the hoplites. Traditionally, historians date the origin of the phalanx of ancient Greece to the 8th century BC in Sparta. It is perhaps more likely that the formation was devised in the 7th century BC after the introduction of the aspis by the city of Argos and this is further evidenced by the Chigi vase, dated to 650 BC, identifying hoplites armed with aspis and panoply. Two of the basic strategies seen in earlier warfare include the principle of cohesion and this would suggest that the Greek phalanx was rather the culmination and perfection of a slowly developed idea that originated many years earlier. Skirmishers are light infantry or cavalry soldiers stationed to act as a vanguard, flank guard, or rearguard, screening a tactical position or a larger body of friendly troops from enemy advances. 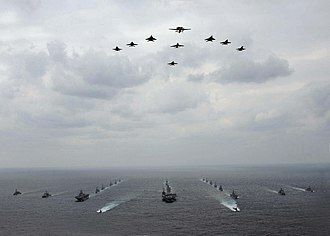 They are usually deployed in a skirmish line — an irregular open formation much more out in depth and breadth than a traditional line formation. Their purpose is to harass the enemy — engaging them in light or sporadic combat in order to delay their movement, disrupt their attack. Skirmishers can be either regular army units temporarily detached to perform skirmishing, light infantry, light cavalry, and irregular units often specialize in skirmishing. Though often critical in screening the army from sudden enemy attacks. In modern times, following the obsolescence of such heavy troops, all infantry has become indistinguishable from skirmishers, and those acting as skirmishers are said to skirmish. A battle with only light, relatively indecisive combat is called a skirmish. In ancient and medieval warfare, skirmishers typically carried bows, slings, skirmishers could be effectively used to surround opposing soldiers in the absence of friendly cavalry. Once preliminary skirmishing was over, skirmishers participated in the battle by shooting into the enemy formation. 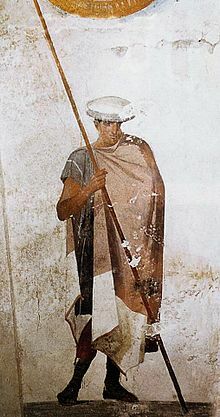 Due to their mobility, skirmishers were valuable for reconnaissance, in classical Greece, skirmishers originally had low status. 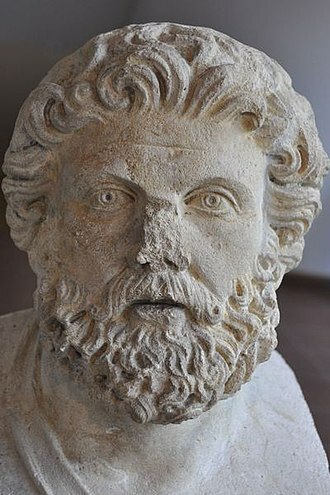 Often Greek historians ignored them altogether, though Xenophon distinguished them explicitly from the statary troops and it was far cheaper to equip oneself as lightly armed as opposed to a fully armed hoplite – indeed it was not uncommon for the lightly armed to go into battle equipped with stones. Hence the low status of skirmishers reflected the low status of the sections of society who made up skirmishers. Additionally and run tactics contradicted the Greek ideal of heroism, plato gives the skirmisher a voice to advocate flight without shame, but only to denounce it as an inversion of decent values. Skirmisher infantry would gain respect in the subsequent years as their usefulness was more widely recognised. Celts did not, in general, favour ranged weapons, the exceptions tended not to include the use of skirmishers. A hypaspist is a squire, man at arms, or shield carrier. In Homer, Deiphobos advances ὑπασπίδια or under cover of his shield, hearing this, Onesilus said to his hypaspist, a Carian of great renown in war and a valiant man. A similar usage occurs in Euripidess play Rhesus and another in his Phoenissae, xenophon was deserted by his horse in a particularly sticky situation. A hypaspist would differ from a skeuophoros in most cases because the bearer is a free warrior. The word may have had Homeric and heroic connotations that led Philip II of Macedon to use it for a military unit. This unit, known as the Hypaspistai, or hypaspists, was probably armed like hoplites rather than as phalangites in Philips Macedonian army. 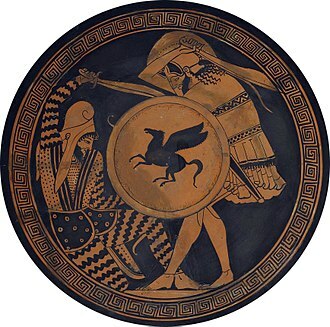 In battle, they were armed with the Greek aspis shield, spolas or linothorax body-armor, Hoplites helmet, dory spear. In set piece battles, the Macedonian Hypaspists were positioned on the flanks of the phalanx, in turn. Their job was to guard the flanks of the large and unwieldy pike phalanx, a soldier with an 18–22 ft. pike. Epaminondas reshaped the political map of Greece, fragmented old alliances, created new ones, and supervised the construction of entire cities. He was influential and invented and implemented several major battlefield tactics. 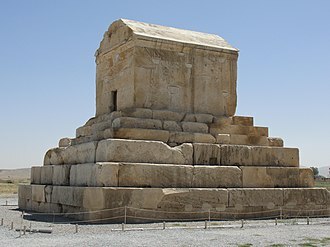 The changes Epaminondas wrought on the Greek political order did not long outlive him, a mere twenty-seven years after his death, a recalcitrant Thebes was obliterated by Alexander the Great. The life of Epaminondas is very poorly attested in the ancient sources, one principal reason for this is the loss of Plutarchs biography of him. 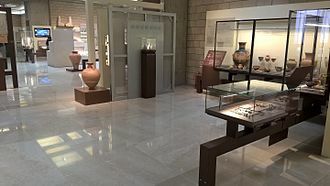 Some details of Epaminondass life can be found in Plutarchs Lives of Pelopidas and Agesilaus II, there is a surviving biography of Epaminondas by the Roman author Cornelius Nepos from the first century BC, in the absence of Plutarchs, that becomes a major source for Epaminondass life. The period of Greek history from 411–362 BC is primarily attested by the historian Xenophon, who idolized Sparta and its king, avoids mentioning Epaminondas wherever possible and does not even note his presence at the Battle of Leuctra. Epaminondass role in the conflicts of the 4th century is described by Diodorus Siculus. 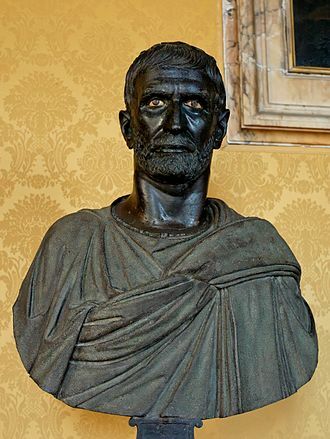 Diodorus was writing in the 1st century BC, and is very much a secondary source. 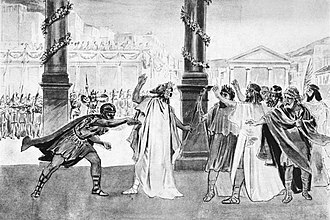 Epaminondas was born into the Theban aristocracy in the late 5th century BC, Cornelius Nepos claims that his father, had been left impoverished by his ancestors. He was educated in his childhood by Lysis of Tarentum, one of the last major Pythagorean philosophers, Epaminondas evidently excelled as a student, and was devoted to Lysis. 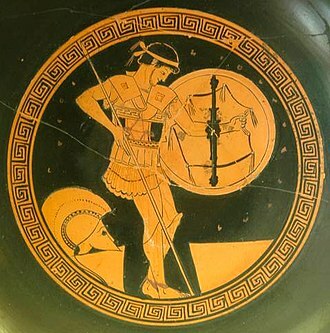 He trained in running and wrestling, but most of all, Epaminondas evidently began serving as a soldier after adolescence, Plutarch refers to an incident involving Epaminondas that occurred during a battle at Mantinea. Epaminondas was certainly not old enough to have served at the First Battle of Mantinea which was in 418 BC and it was at this battle, regardless of exactly when and where this occurred, that a defining moment of Epaminondass early life would happen. Plutarch says that this incident firmly cemented their friendship, and Pelopidas would be Epaminondass partner in politics for the twenty years. Isaak Walraven, The death bed of Epaminondas. Rijksmuseum Amsterdam. Austrian pandur, 1760, using a tree for cover while skirmishing.